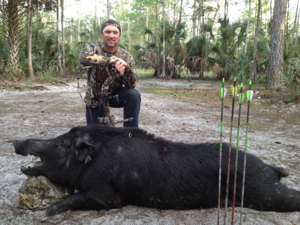 FORT MYERS, Fla. — Red Sox outfield prospect Bryce Brentz is apparently a heck of a hunter, too. He bagged this 290-pound wild boar today while bow hunting. I don’t know anything about hunting. But that seems pretty impressive. It might be interesting to go hunting someday, although I would want a bazooka if that thing came charging through the woods.